Waiting is over as Microsoft made Windows Phone 8.1 official, demonstrating many of its features during the BUILD 2014 conference in San Francisco. Key elements of the new version are Cortana voice assistant, action center, overhauled start and home screens, new settings options, Universal App & Enterprise support, and more. Microsoft improves dramatically the user experience in all areas, so the platform can finally compete effectively with iOS and Android. 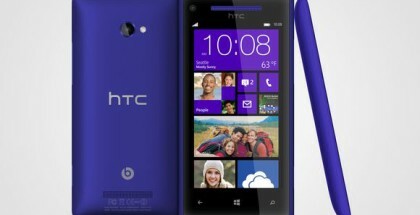 All changes and new features are designed to make your Windows Phone “the most personal smartphone” ever. There will be a new glide/swype keyboard, Wi-Fi and Storage Sense, improved Skype, and improvements in Windows Phone’s core – People, Photos, Music and Video, Wallet. The most interesting innovation in Windows Phone 8.1 is the personal voice assistant Cortana, which replaces the current Bing search functionally. She detects and analyzes web and personal data, giving suggestions and assistance. Cortana is activated using the search button or via her Live Tile on the Start screen. 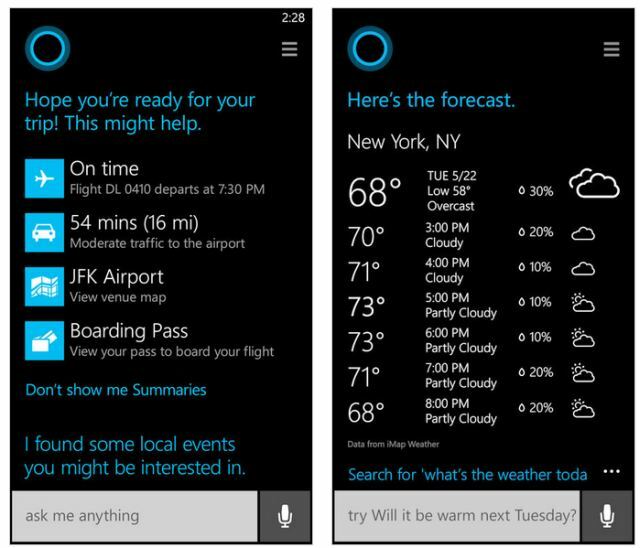 Cortana’s home screen allows users to speak queries or use the phone’s keyboard to type. She displays personalized information, including traffic, weather, flights and other useful data. Windows Phone’s digital voice assistant is smart – she asks questions and monitors user’s behavior, storing all information in a notebook, so customers can control and remove data from Cortana’s notebook. 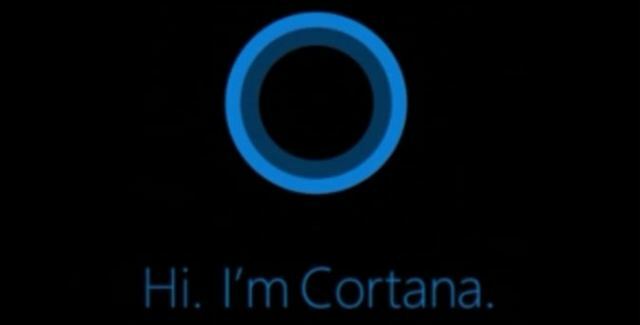 Microsoft announced that Cortana will launch in the USA as a Beta, with other countries to follow after July 2014. 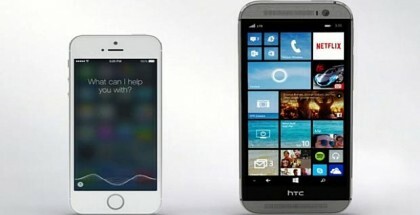 The voice assistant will initially be available in English, with other languages expected to join sometime in 2015. Start Screen in Windows Phone 8.1 supports custom backgrounds. 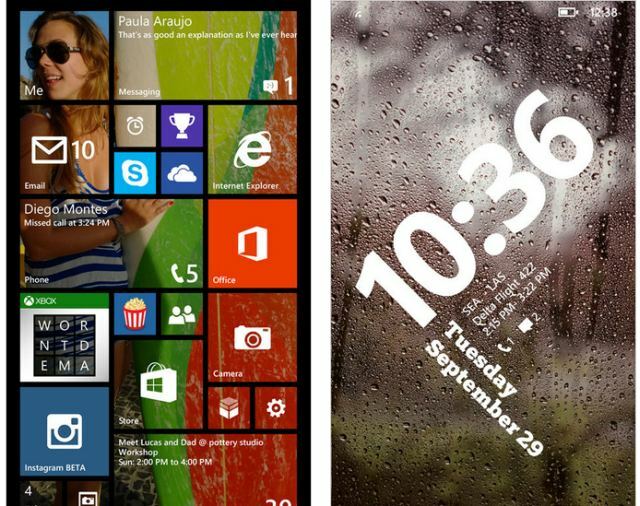 Users can make their Live Tiles transparent, skinning them with a custom photo. Live Tiles support reduced update times, while the Lock screen includes new customization options such as ‘Themes’, new icons and notification arrangements, plus third party developers support. Users can view notifications and access key settings by swiping down from the top. Action Center gives a quick access to all notifications, alerts and key settings, complementing the Live Tile system. 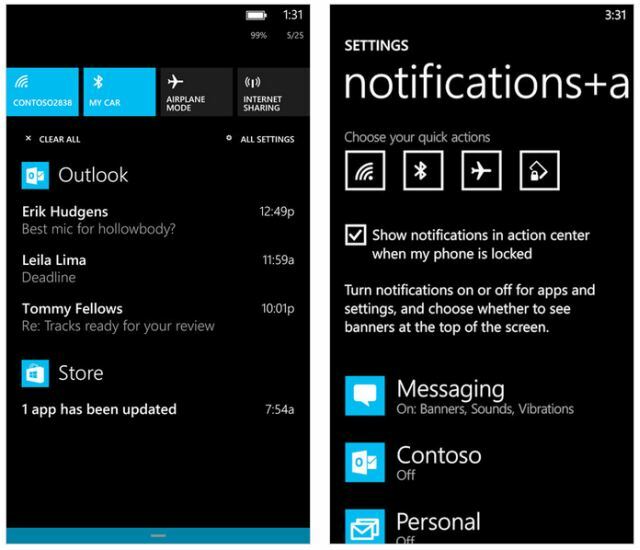 Windows Phone 8.1’s new Action Center improves dramatically the notification experience of the platform, addressing one of the major user complaints about the platform. Notifications are grouped by originating apps, so users can easily modify, update or delete them. The new Data Sense includes ‘high savings’ options, allowing users to compress images, while browsing the Internet. Wi-Fi Sense improves the Wi-Fi usage, allowing users to connect into a network automatically. Another new option lets you share network passwords with other users. Storage Sense gives you more control over memory and storage capacity of your Windows Phone handset. Users will be able to move files between microSD card and built-in storage, while apps can be installed directly on the microSD card. Finally, Microsoft updates Battery Saver, which now shows breakdown of battery usage by different apps. People Hub has been updated with new, larger photos, and improved social integration. Photos Hub also updates with larger photos, as well as with improved app integration. Microsoft’s default camera includes new burst mode and design improvements, while Music & Video Hub splits into two separate apps. Windows Phone 8.1 improves the volume control, adding separate sliders for apps/media, ringer/notifications. Calendar app updates with a new week view and Outlook-like design. Third party developers will be able to create improved calendar apps using Windows Phone APIs, while Skype for Windows Phone 8.1 includes FaceTime-like calling and Cortana integration, so users can start video calls using voice commands. 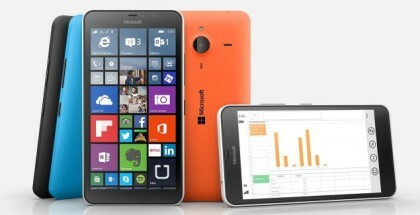 Windows Phone 8.1 will reach all existing devices in the coming months, while the new Lumia 930, 630 and 635 will start shipping in early May preloaded with the new update.